In the program of Barker Playhouse’s production of The Shadow Box, director Jeff Sullivan notes the definitions of “shadow box” as: “to spar with an imaginary opponent as a form of training” and “a case with a protective, transparent front, used for displaying objects of value.” Both seem relevant to the premise of the play: Three terminal patients agree to live in cottages on hospital grounds and undergo regular interviews with a psychiatrist as part of a research study. For the first, the “imaginary opponent” would be the interviewer, who is only heard and never seen, making him seem like an imaginary or else omnipotent figure. In the second definition, the cases are the cottages themselves, with the patients and their lives on display to the audience. The first of the patients is Joe (Dennis Bouchard), who has come to terms with his fate, but the same cannot be said of his wife, Maggie (Karen Besson), who is arriving that day along with their rambunctious teenage son, Steven (Nick Griffin), who’s eager to show off his new guitar to his father. In her denial, she refuses to even enter the cottage, and she has yet to tell Steven that his father is dying. 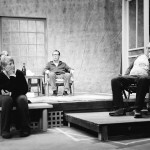 The tension between them as they dance around the subject of Joe’s prognosis is palpable, until Maggie is finally forced to face the truth in one of the most emotional moments in the play. The second cottage houses Brian (David Crossley), a writer who intends to leave nothing unwritten, cobbling together pages upon pages of, according to his lover, Mark (Christ Rodriguez), utter nonsense. Enter Beverly (Kathleen Povar), Brian’s vivacious ex-wife, to breathe new life into Brian’s final days. While Brian is delighted by her presence, Mark is less than thrilled with her frivolity and blunt approach to the situation at hand. Povar’s presence is loud and unapologetic as Beverly, while Rodriguez’s Mark is overprotective and tired, and above all, scared, as Brian’s caregiver. The moment where Beverly, with surprising solemnity, tells Mark off, finally forcing him to confront his feelings, is emotional and poignant, and the final moment between Brian and Mark is sweetly touching. Constant in each subplot is the interviewer, voiced with unnerving cheer and condescension by Stephen Hug. The way the play is structured, the audience almost becomes a part of the research team, as each patient asks if others are with the interviewer, watching them. Hence, the shadow box through which we watch these events unfold. This play offers no answers – what answers are there where death is concerned, anyway? – only observations on different ways people deal with death. It should come as no surprise that playwright Michael Cristofer was inspired to write The Shadow Box by his own experiences of having two close friends die of cancer. Anyone who has watched the decline of someone they love will be hit hard by this one. The Shadow Box runs through Feb 3 at the Barker Playhouse. For tickets, call the box office at 401-273-0590, or email players1909@gmail.com.